The Buzz: Pelosi: Stay or Go? After advocating that Nancy Pelosi should retire at the beginning of each new Congress since her loss of the Speakership in 2010, I’ve just been quoted suggesting that now is a moment her experience and gravitas is needed by the party. Democrats have new power and a mandate from the public to rein in the administration, but how that is done will require great skill. A gaggle of House Committees, all launching investigations with no accompanying legislative strategy, will simply hand President Trump a new image to label Democrats a mob damaging the country and economy. The large freshman class has many liberals anxious to take on the administration and fulfill some of their more controversial constituencies’ desires. The House will be in need of discipline. Among House Democrats, Pelosi “has the arguments of raising money and knowing the system,” Ciruli said. While a faction of the party is calling for new leadership, Pelosi might be appreciated for her ability “to rein in an incredibly tough president without making him look sympathetic,” he said. Managing a House of 435 members and a caucus of 230 Democrats is very serious work. Pelosi backed up President Obama for six years as Minority leader and took on Trump for two. For all her image baggage, she’s ready. However, Gallup reports Democrats are ready for a change. By 56 percent to 39 percent, Democrats say it’s time to replace Pelosi. A number of newly elected Democratic congresspersons pledged in their campaigns to not support her for Speaker. A few senior Democrats, like Colorado’s Ed Perlmutter, are trying to organize a challenge. And, of course, Pelosi is a foil for nearly every Republican campaign. Most likely, Democrats will bring some new faces into leadership. It’s also possible, like John Boehner, she may step down before the next election cycle in 2020, but for now, Democrats should be cautious in this selection. 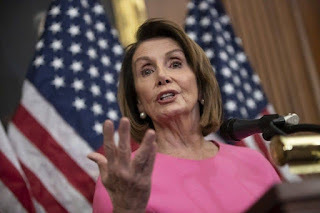 The Dimocrats should make her speaker and then she should quit a week later. It is time for for Xers to take over and for the Boomers and Oldsters to get out of the way. The Dimocrats should only support candidates under the age of 56.